Mosaic of the latest, most cloud-free (but not snow-free) Landsat 8 imagery covering the globe rendered using three different infrared bands 7,6,5. The Landsat program is a series of earth-observing satellite missions jointly managed by the National Aeronautics and Space Administration (NASA) and the United States Geological Survey (USGS). The first Landsat satellite launched in 1972, and the latest satellite in the series, Landsat 8, provides continuity, as well as improvements, on important global monitoring of our earth. Landsat 8 was launched February 11, 2013, and contains two sensors. One collects 8-band multispectral imagery at 30-meter resolution, as well as panchromatic imagery at 15 meters. The other collects thermal imagery at 100-meter resolution. The orbit of the satellite results in it capturing 170-by-185-kilometer-sized scenes along a predefined path that returns to the same location every 16 days. 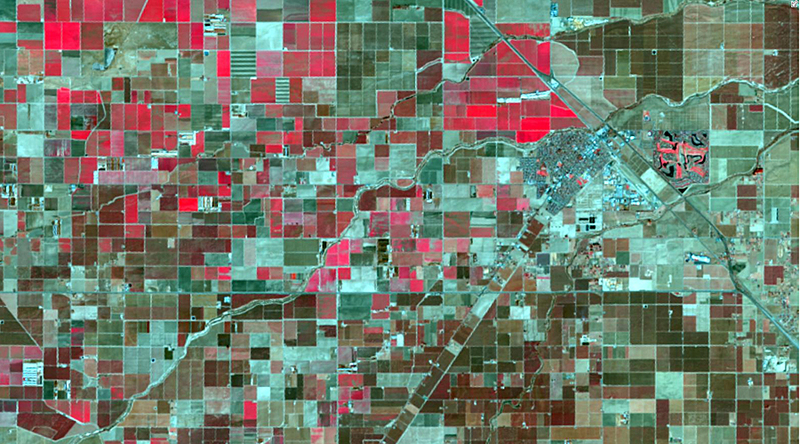 Landsat imagery has significant value in environmental and natural resource studies and research, such as agriculture and forestry. Both governmental and nongovernmental organizations interested in monitoring urbanization or analyzing concepts such as carbon sequestration will also find the continual monitoring of the earth at medium resolution to provide a wealth of information. The education aspects of the services are also boundless. As with the other satellites, USGS manages the collection of imagery from Landsat 8. Every day, staff receive and process approximately 450 new Landsat 8 scenes. These scenes are available for download at no cost within 24 hours of acquisition. 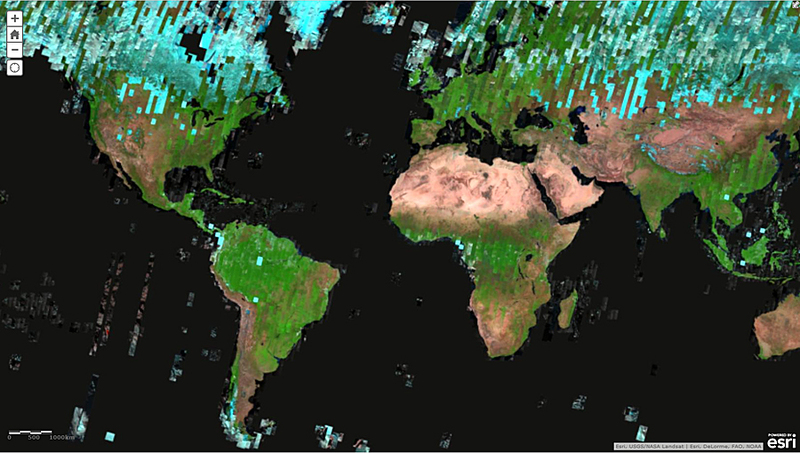 The current archive of Landsat scenes now contains more than four million scenes. Full-resolution, natural-color renderings of these are quickly accessible using LandsatLook, which is powered by ArcGIS for Server. A new set of Landsat 8 services released by Esri provides access to the latest and best Landsat 8 scenes. These services make the valuable Landsat scenes from USGS quickly accessible as multispectral, multitemporal image services that can be used in a wide range of web and desktop applications. Esri first released Landsat imagery services—more than eight terabytes—to ArcGIS Online users in 2012. These image services made the collection of Landsat Global Land Survey (GLS) scenes spanning the years of 1980, 1990, 2000, 2005, and 2010 accessible as more than 20 dynamic, multispectral, and multitemporal image services. These dynamic services enable a wide range of client applications, such as temporal access to any of the band combinations, as well as products such as Normalized Difference Vegetation Index (NDVI) without the need to download or locally process any data. Landsat 8 color infrared (bands 5,4,3) of Chowchilla, California, highlighting vegetation in red. For the Landsat 8 services, Esri daily downloads the latest, approximately 300 Landsat 8 scenes and adds them to a set of image services that contain the best and most recent 50,000 Landsat 8 scenes, which require about 60 terabytes for storage. These scenes are hosted on Esri’s cloud infrastructure and available for access in different modes. By default, the user views the best scenes. The best scene is determined using a weighting of cloud coverage and age of the scenes. Users can reorder the scenes based on metadata attributes, lock onto a specific scene, or use a time slider to see how an area changes with time. Not all scenes are kept; otherwise, the data volumes for storage would continually increase. Instead, older scenes are removed. Typically, the latest four scenes with less than 50 percent cloud coverage are kept, as well as the scene that is nearly cloud free and closest in date to the GLS 2000 scene, so as to aid in longer-term change analysis. Services can be accessed in web maps but can also be used in a range of applications and ArcGIS for Desktop. A subscription to ArcGIS Online is required to access the services, but there is no charge for usage. A number of different image services are served from the same source. The most used is the Landsat 8 Views service. This allows users to view a range of different band combinations including natural color (bands 4,3,2) and color infrared (bands 5,4,3), which highlight photosynthesis in plants. The agriculture band combination (bands 6,5,2) highlights differences in various crop types. The SWIR band combination (bands 7,6,5) provides better penetration for clouds. The bathymetric option (bands 4,2,1) provides better water penetration and is especially useful for coastal applications. Users can also select any user-defined band combination. The functions can be applied with fixed enhancements or with the Dynamic Range Adjustment Stretch, which requests the server to maximize the contrast so as to get the most out of the extended dynamic range of the sensors. The Landsat 8 Views service also provides two indexes. The Colorized NDVI provides information on the health of vegetation, while the Colorized Normalized Difference Water Index highlights areas that have high moisture content. The Pan-sharpened service provides enhanced natural color imagery by sharpening the natural color bands (4,3,2) with the 15-meter panchromatic imagery. The Panchromatic service provides access directly to the panchromatic imagery. Again, the dynamic range adjustment capability ensures that maximum information content is available even when used in web applications. While all these services return 8-bit rendered versions of different products, the Analytic service enables applications to access the full range of data values that might be required for some analysis applications. All these services are powered by ArcGIS for Server and the Image extension. Processing and dynamic mosaicking are performed on the fly, directly on the source data. All the processing is applied on the source imagery as it is accessed by the server, enabling the creation of multiple products, as well as enabling the full dynamic range of the imagery to be accessed even when using browsers that are limited to only 8 bit. The server also applies user-controllable compression. This ensures that the data is transmitted back to the client application quickly, even over low-bandwidth networks. It is important to note that no lossy compression is applied on the stored images. This ensures that there is no data loss or compression artifacts in the processing. These services extenuate the cloud concept of “move the processing to the data, not the data to the processing.” Users can define the processing to be applied on the Esri-hosted servers and receive only the results they want. There is no need to download the complete set of data used to get the results. Since these servers are using the latest ArcGIS 10.2.1 for Server, developers can also define their own functions to be applied on the servers. This opens up the ability for remote-sensing experts to quickly test and apply a wide range of indexes and functions to the data. Results can be returned for any location on earth over multiple time instances. The on-the-fly processing also includes supervised classification. This enables users to define training areas, with the server computing the signatures and then applying the appropriate supervised classification to return classified imagery. This can be used to quickly perform classification and create web maps or statistics on the result. For example, if the area of a burn scare or flooding needed to be approximated, Landsat 8 imagery can quickly provide answers. Esri will continue to expand the services provided, including development of different applications and more advanced geoprocessing of the scenes. More capabilities and functionality will continue to enhance this great resource. To access the services, search for Landsat 8 in ArcGIS Online or visit esri.com/landsat-imagery.